Announcing the winners of the 50th ever Right Place Photo Caption Contest! Presenting the top 25 captions for this picture from AP Photo/Northside Center for Child Development, Gregory P. Mango via Yahoo! -- "You know, honey, after I'm done with that dress, it'll be a black-and-white gala, if you know what I mean." -- "I'll buy you all the jewelry in the world, sugar. I even have a pearl necklace in store for you later..."
-- CLINTON THOUGHT BUBBLE: "Hmmmm... full-figure woman with a black dress that hides stains well... might be a good night!!!" -- "Hey, honey, meet me under the desk after the show." -- "I've got one word for you, honey... silicon." -- Bill, smiling in anticipation, wonders if the rug will match the drapes. -- The recipient of this year's "Most Likely To..." award reacts to a good-natured goosing from the "Presidential Staff". -- Proof that Slick Willy's willy isn't as spry as it used to be. 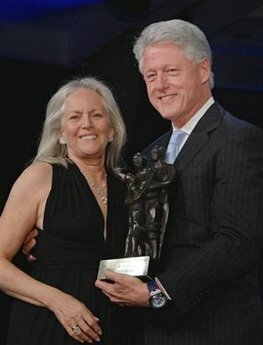 -- BJ Clinton approves of Barbara Bush's makeover. -- "Relax, baby. It's not unusual for me to find two, five, six.. or even more erogenous zones women didn't know they had." -- "Hey, is this a Maidenform I Value Luxury™ Lace Balconette I'm feeling up? Nice." -- "I'd like to thank the Academy for this award... and the after party favour!" -- "Just keep smilin', honey, and be very quiet. Once we slip past Hillary, we're home free." -- "Get the Secret Service, I'm gonna need some help getting both of these home." #10: Bill shows off his limited edition "Golden Girls" life-size Barbie. #9: The remake of Grey Lady Down failed to inspire the maritime audience. #8: "Hey, baby, these statues are just a preview; I was the first black President, after all..."
#6: Bill Clinton displays his pleasure at finalizing the deal that sent Hillary to the Cowboys for an old cheerleader and a statue of Tom Landry. #5: "Nice cans. Know any convicted felons who could use a pardon?" #4: WOMAN: "Feeling my pain?... Hmmm... no... that's... my breast." #3: "I... did... not... have... sexual... relations --- Oh, wait! I really haven't yet!" #2: "This time, if anything happens... the dress goes with me." #1: Just seconds after this picture was taken, the Secret Service wrestled Bill Clinton to the ground for his own protection. Stew tries his hand at photoshopping.